Mistakes to avoid in your Bathroom Remodel Some things are meant for other rooms in your house, rather than your bathroom. Don’t waste your well earned money on your next bathroom remodel. Avoid bathroom remodel mistakes by avoiding these materials or colors. Carpet is majorly discouraged by the Center for Disease Control and Prevention. Yes this is one comfy flooring to rest your toes on after a long bath, but this material harbors mold, mildew and bacteria. Ultimately carpet in your bathroom is a health concern, more so than a decorating fail. 30 years ago this was a big trend in the remodeling industry, now we are more aware of the risks imposed by carpet in bathrooms. Skip the carpet and opt for a few bathroom throw rugs that can be washed and dries regularly. Tile flooring in bathrooms is a great surface to choose when remodeling your bathroom floor. Tile is easy to clean and disinfect, durable, there are a millions design and color options and will last as long as your bathroom. We all see the fancy bathrooms in the magazines that display lavish wall paper; fact of the matter is that any high moisture will cause the wall paper to peel eventually. Think about this, why use wall paper in a steamy room, when people use steam to remove old wall paper? Your bathroom produces the most moisture and steam in the whole house. If you must, absolutely must, have your bathroom wall papered – use a high quality, Vinyl wall paper. DO NOT attempt to use a peel and stick wall paper, this will be a waste of time and money. Peel and stick wall paper will bubble and peel within weeks if not days. Wall paper will last the longest in half bathrooms or bathrooms used less frequently. Avoid breaking out the Canary Yellow paint for your bathroom remodel, as this color is not a great choice for bathrooms. Yellow and yellow tones can make a bathroom look brash, and create a room that obscures your reflection. Ladies, note to self, don’t apply makeup in a yellow room. 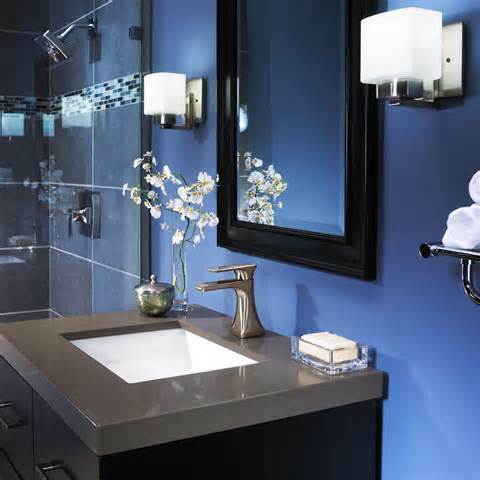 Choose colors that have a gray or blue tint to get that Spa like feel in your bathroom. Also consider the size of your room before picking a paint color. Darker colors are best suited for larger rooms, and light colors for small rooms.